If you haven’t seen this video you need to check it out. At your desk right now, you’ve got a chance to worship with the God of second chances. Don’t miss an opportunity like this. Primal, great book. It’s about getting back to the core of Christianity. And it does that. It’s challenging, stretching, and it pushes you to action. I’m definitely a fan of the way Mark Batterson deals with these two issues specifically: Scripture and Worship. I love how he challenges us to get back to the basics of Scripture and pushes you to redefine worship in your own life. Plus there is the way in which Batterson writes his books. The way that he uses science, art, travel, philosophy, and religion to illustrate the complexity of God’s creation and dare I say “wonderment” of God. He pushes you to think. It’s frightening how many things, most see as mundane, Batterson can totally reform to illustrate the complexity and awe inspiring glory of God. “For the record, there are approximately two thousand thunderstorms somewhere on planet Earth at any given time. And there are approximately one hundred lightning strikes per second, or 8.64 million lightning strikes per day! That is a lot of standing ovations. But according to the psalmist, the angels shout, “Encore!” after each one. If you are trying to get back to that place where you felt most primitive, and yet alive in your relationship with God, then Primal is the book for you. Hats off to Batterson for another challenging and inspiring read. 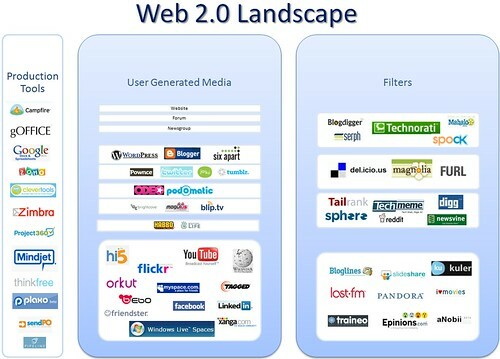 Web 2.0 Landscape, originally uploaded by vincos. So I can’t get this off my mind. Someone in #kidmin world I need your help! I am trying to develop and Integrated Web Strategy for BrookwoodKiDs and frankly can’t find any examples. Please point me to this somewhere. How do we communicate to each of these groups on the web? Hit the tweet button to spread the word, unless you know then drop me a comment!!! Deep Thought, originally uploaded by rohicks. So for the last three months, I’ve been writing… Alot. We’ve really been trying to push to write devotions relevant to kids that there parents can guide them through. We’re hoping these would help parents begin to start a conversation on spiritual issues. I just wanted to share a few things that I try and include in every devotional that I write. This is always where I start. The Bible is always relevant so I try and find an issue to talk about that kids are dealing with. You can actually find a list in most Study Bibles. Issues like anger, peer pressure, trying to fit in, etc. Then I try and imagine that issue in our context and write based on that. This is difficult but I always try and push the family, kid or even parent to an action. We can’t just be hearers, we must do. Application is key in these devotions because they give kids something tangible to do. Does that mean that I have questions at the end of each devotion? No. But it does mean that you should find something that will cause discussion. Maybe ask them to think about a funny story or their favorite color, anything to get parents to have a conversation with their child. Let’s start with that and then move them to the Spiritual. Getting them to pray together. It’s profound having a conversation with God together as a family. It really is cool to see everyone being honest and I hope that the families that use these devotions would get to experience that. I try to give them a guide, also trying to promote discussion, even if it’s just in their heart. A possible ad for the Nook E-reader, originally uploaded by malept. I have seriously been thinking about buying a digital reader. It seems a bit weird to me though. I’m not gonna lie, in this area of my life, I am pretty hesitant about being ahead of the curve on technology. I mean I love books. I love the smell, the feel of the pages, and the feeling you have when you see exactly how much you have read by the size of the wad of paper on the left side of your thumb. But knowing that I will probably make the switch sooner rather than later, here is a write-up that might help you make a decision. Takeaways: Love the lend a book, like the added bonus of offers for being in a barnes and noble bookstore, and love the ability to add storage space. Watch this. Unbelievable story. Incredible effort by this school. I know I don’t post alot of my production stuff, but I thought this might help someone. The following video is week 1 of a set of 8 week Basketball Devotions for 1st and 2nd graders. We had a volunteer draw some pictures of key parts of the story. I scanned those pictures in and used some simple keyframe animations to help “illustrate” the story. I used Motion 3 for this project but the keyframes could have been done in another video editing program just as easy. Anyway, this was a year ago and gives you a great alternative to professional illustrations! Now usually I’ll give you my own personal insights but I really want you to go check out this post by Kem Meyer. And if you don’t already subscribe to her and you are loving this Marketing Series, then you would be hurting your growth in this area if you didn’t subscribe to her blog. Now she goes very corporate to give you a picture of what the Identity Crisis looks like with brands. However, when you look at your church, can you say that all aspects from Communication to Assimilation to Environment to Content to Message are all unified in their apparent purpose? If they aren’t then what does that communicate to prospective “shareholders”? What are you leaving out of the loop when it comes to the heart, core, nucleus of what you do? By leaving that thing out does it communicate something different than the message you intend for people to receive? I’ll give you an example for #kidmin that most of us probably never think about. Preschool-check in. What value do our preschoolers get from checking in to a desk where they can’t see the attendants and they have nothing to occupy their attention? Where is an area that you think the church might not be considering when trying to communicate the heart, core, and nucleus of what they are about? There are some changes going on where I work…. 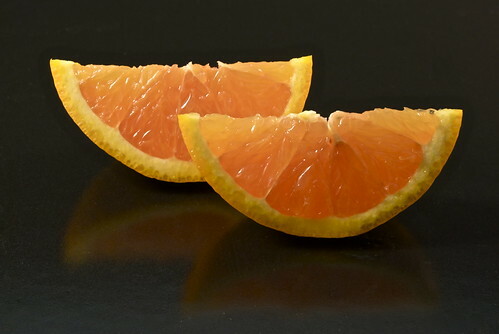 Orange Wedges on Black, originally uploaded by S_Freer. I’m pretty excited about them to say the least. Can you figure out what’s going on? Maybe you don’t feel like you can totally take on the brunt of change in your ministry and the way they market themselves? Would you like a very easy and practical way to get started without having to just totally destroy any bridge you might have by asking for a total overhaul? Or would you just like to get your feet wet a little bit? Or are you just ready to get past the overly utilized, yet classic infomercial introductory question time? Then the SWOT analysis is for you!!! But seriously a great place to start is a SWOT. Contrary to what you might think this has nothing to do with slapping anyone’s wrists or destroying insects, but instead has everything to do with gaining a little focus for your ministry. Ask yourself some questions about each of these. What would the community say are the strengths of our ministry? What assets do we possess? (financial, property, key relationships, or maybe just awesome people)? What needs are we meeting in the community? What would the community say are some weaknesses that are present? Do we have any liabilities? Are there some needs that are obvious that we are not meeting? Are there trends in your community that you can support, be a part of, or contribute to? Are there needs in the community that we can meet that no one else is? What opportunities are there in the community that align with out strengths? Any community trends that could hinder your impact? What is the plan after this leadership is gone? Again this is a pretty basic SWOT. But it’s a great place to start the process and gives you some nice ideas with where to go from where you are now! Hope this helps you out. Have you ever been a part of a SWOT analysis? Give me some details, let me know what the process was like.